Dr. Kevin wâsakâyâsiw Lewis is a nêhiyaw (Plains Cree) instructor, researcher and writer. 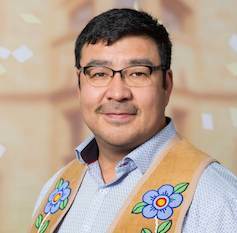 Dr. Lewis has worked with higher learning institutions within the Prairie Provinces of Manitoba, Saskatchewan and Alberta in the areas of Cree Language Development and Instructional methodologies. His research interests include language and policy development, second language teaching methodologies, teacher education programming, and environmental education. For the past 15 years, Dr. Lewis has been working with community schools in promoting land and language-based education and is founder of kâniyâsihk Culture Camps a non-profit organization focused on holistic community well-being and co-developer of Land-Based Cree Immersion School kâ-nêyâsihk mîkiwâhpa. Dr. Lewis is from Ministikwan Lake Cree Nation in Treaty 6 Territory.